Rugged limestone mountains, deep boulder-strewn gorges, Bronze Age villages and idyllic coastal trails are the locations for scenic and exciting hikes on this Sardinian walking holiday. Explore the natural beauty of the east of this wild and unspoilt island staying at both a welcoming farm-stay in the tranquil interior and contemporary hotel on the stunning Gulf of Orosei coast. After joining the trip at Olbia airport, we drive (1 hour 20 minutes) to our base for the next four nights, the welcoming, family-run Agriturismo Canales. Nanni and Lina's farm-stay occupies a tranquil setting overlooking Lake Cedrino, with views to the mountains beyond. The small agricultural town of Dorgali, known for its crafts and ceramics, is around five kilometres away. The agriturismo's small restaurant serves up tasty cuisine each night including typical Sardinian fare such as hearty pasta dishes made with the local Gnocchetti and Seada, a sweet semolina fritter flavoured with pecorino cheese, lemon and honey. Today's walk will take us to one the most spectacular viewpoints in Sardinia, offering panoramic views over the whole of the Supramonte Mountains and beyond. The Supramonte range is characterised by its rugged karst (limestone) topography from which rivers have carved out deep canyons and ravines. After driving to the start point of our walk near the steep gravel track of Scala 'e Pradu (approximate altitude 900m) we climb up onto the barren limestone plateau that stretches between the peaks of Monte Corrasi and Punta Sos Nidos. We ascend Monte Corrasi first; at 1463 metres it's the highest peak in the Supramonte. The views from here are simply astounding, reaching from Punta La Marmora (Sardinia's highest peak)) and the Gennargentu Mountains to the west to the Oddoene Valley and the Mediterranean Sea to the east. After enjoying the view, we continue at first downhill and then uphill again to the summit of Punta Sos Nidos (1348 m) for a great view down into the Valley of Oliena, hundreds of metres below. The final stretch of our trek takes us back to our starting point. Today's 12 kilometre walk is expected to take around six hours with a total ascent of 600 metres and a descent of 550 metres. Our drive this morning to the starting point of our trek near S'Arena takes us along the western fringes of the Gennargentu and Gulf of Orosei National Park, offering stunning views to the east and on towards the Girgini Forest. 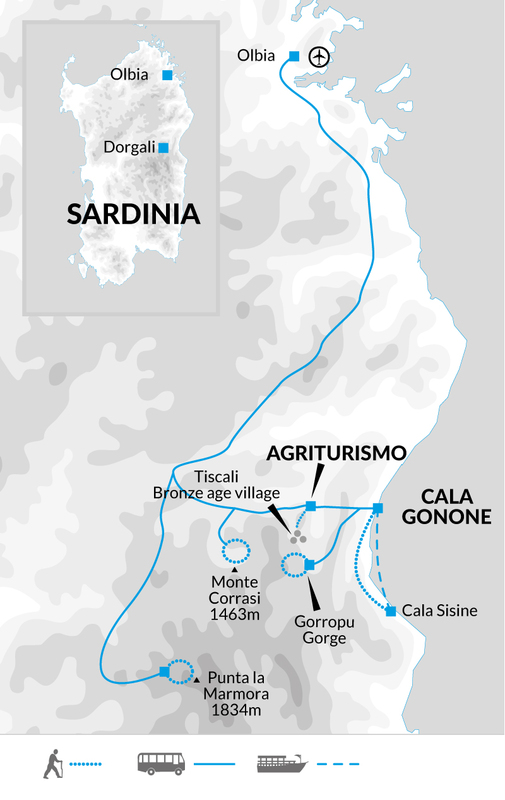 Our aim today is to reach Sardinia's highest point, Punta La Marmora (1834 m), starting out at around 1500 metres and passing over Sardinia's second highest peak Bruncu Spina (1828 m). We trek through a bare, windswept landscape covered only by low ground-hugging shrubs and rocks. Throughout April and the beginning of May, snow may still be covering parts of the path. If we are lucky we may spot wild mouflon sheep and soaring eagles, as well as small groups of horses left to graze on the mountains flanks. A variety of colourful wildflowers can be spotted during spring and early summer. Today's 15.5 kilometre walk is expected to take around five-and-a-half hours with a total ascent of 735 metres and a descent of 685 metres. We begin our day with a short drive into the Lanaittu Valley to the Sa Oche Cave where we visit the nuragic temple of the Sacred Spring, an archaeological site discovered only recently. The Nuragic civilization of Sardinia lasted from the 1800 BC (Bronze Age) to the 2nd century BC, with its name deriving from the nuraghe, a fortress-tower construction, the remains of which now dot the Sardinian landscape. The cult of water was an important element of the Nuragic religion and many well-temples and sacred springs were constructed. We set out from Sa Oche, initially along a wide gravel road which later narrows to a rocky footpath, as we climb up to the site of the village of Tiscali, located in a depression at the top of the mountain of the same name. Invisible until you climb down into the depression, it's thought the village was built here for defensive reasons. A number of nuraghe dating back to the first millennium BC can be seen. In the centre of the site a wide window in the rock opens out onto the Lanaittu valley below. We descend to Sa Oche by a different route, taking us through a narrow gorge with lush vegetation where, if we are lucky, we could spot wild boar or a family of wild mouflon sheep. Today's nine-and-a-half kilometre walk is expected to take around four hours with a total ascent and descent of 350 metres. We say goodbye to the agriturismo this morning and head for the coast to experience a different side of Sardinia. Our next three nights will be spent at a hotel in the seaside village of Cala Gonone on the Gulf of Orosei. This is a laid back place where life gravitates towards the long seafront promenade with a scattering of bars and restaurants and a gently shelving beach. The day is left free. You may choose to take a break from walking to relax on the beach at Cala Gonone or nearby Cala Fuili or catch a boat further along the coast to visit various other remote and beautiful beaches and caves. There are also coastal walking options that your leader will be able to brief you about. We catch a boat south to Cala Sisine this morning and enjoy fabulous coastal views of the limestone cliffs and turquoise waters of the Tyrrhenian Sea. Cala Sisine is an unspoilt sandy beach in a gorgeous cove from where we start our trek along a section of the renowned Selvaggio Blu trail. The Selvaggio Blu (Wild Blue) is a multi-day trek, abseiling and climbing expedition that runs for over 50 kilometres along a stretch of Sardinia's remote limestone east coast. But don't worry - the section from Cala Sisine to Cala Gonone that we hike involves only walking! The rocky trail undulates up and down the cliffs from Sisine to another beautiful beach, Cala Luna at nine kilometres from where there's an option to return to Cala Gonone by boat. For those wishing to continue, it's another five-and-a-half kilometres on to the end of the trek, the beach at Cala Fuili , a 20 minute walk back to our hotel. Today's 14.5 kilometre walk is expected to take approximately five-and-a-half hours with a total ascent of 845m and descent of 910 metres. Today's walk is in the amazing Gorge of Gorropu, dug out by the forces of the Flumineddu River. After breakfast we drive along one of the island's most panoramic roads, to the trailhead of the path at the Genna Silana Pass at a little over 1000 metres. From here we walk along a steep gravel track leading slowly down to the canyon entrance, passing through the fragrant Mediterranean maquis, coloured by wildflowers and the red fruits of the strawberry trees. On arrival at the gorge, local guides will explain the nature and geology of this amazing canyon after which we set out to walk and explore this wonder of nature on our own. The further we hike into the gorge, the bigger the boulders we have to climb over and the narrower the passages we have to squeeze through, until we reach the point where the base of the gorge is only five metres wide. From here we make our way to the gorge entrance and follow an easy trail along the river to our pick-up point near a bridge over the river. 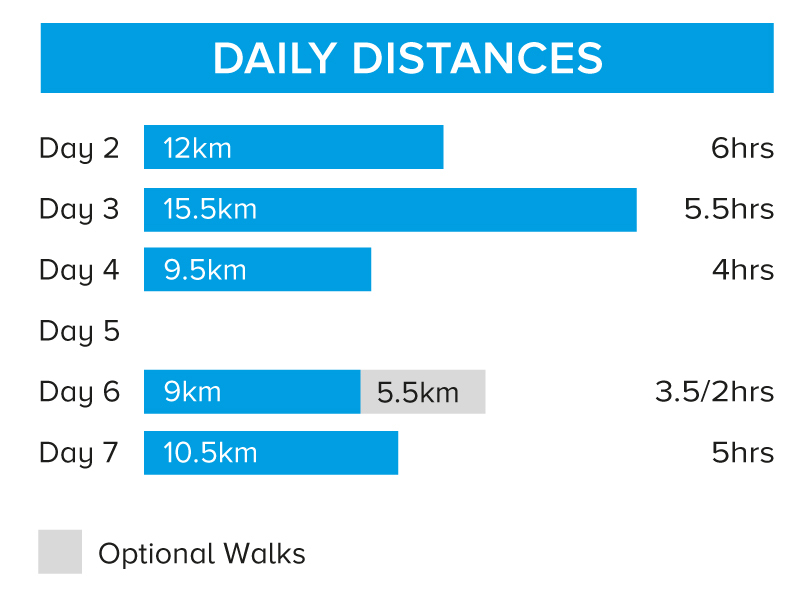 Today's 10.5 kilometre walk is expected to take around five hours with a total ascent of 65 metres and descent of 800 metres. We drive back to Olbia Airport today where our Sardinian adventure ends. Bring light and comfortable clothing that can be layered according to the temperature. The weather conditions in the mountains can be changeable, and it can become cool especially early and late season so make sure you bring warmer layers. Tops made from wicking materials which keep you drier and warmer are recommended as a base layer, and walking trousers are preferable to trousers of heavier material such as jeans. A waterproof jacket is essential at all times in case of rain and wind. The first four nights of the trip are spent at the family-run Agriturismo Canales. Nanni and Lina's farm-stay occupies a tranquil setting overlooking Lake Cedrino and with views to the mountains beyond. The small agricultural town of Dorgali, known for its crafts and ceramics is around five kilometres away. The en suite rooms are simply furnished in a rustoc Sardinian style. The agriturismo's small restaurant serves up tasty cuisine each night including typical Sardinian dishes. Hotel Cala Luna is a small hotel located just a few metres from the seafront in the laid back seaside resort of Cala Gonone. En suite rooms are furnished in a contemporary style. The hotel has a small gym and sauna and mountain bikes are available for guests' use free of charge. Its restaurant specialises in local seafood. Walks on 5 days for between 4 to 6 hours. Terrain varies from dirt and gravel tracks to rocky trails. Some light scambling and rock-hopping may be required on sections of the gorge and mountain walks. This trip is only suited to sure-footed walkers who are confident walking on this type of terrain.